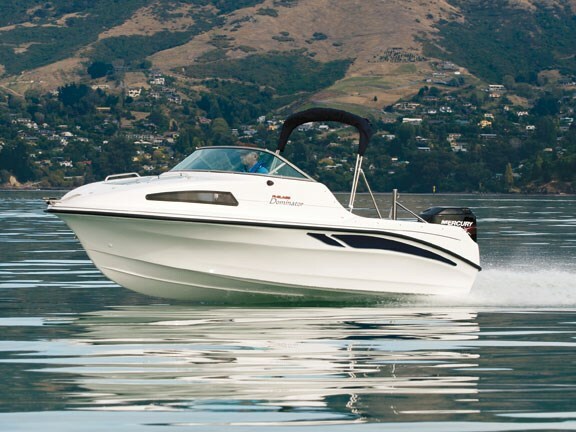 Fi-Glass Boats are built in Christchurch. A stand-out refinement was the use of Kleg Cell in the transom rather than wood. Kleg Cell material is an artificial polymer that allows for improved adhesion, reducing or even eliminating the delamination some wooden transoms experience and with much increased durability. Other refinements include polyureathane filled sub-floor cavities and solid fibreglass stringers. The addition of this polyureathane foam adds to the buoyancy of the boats to the point were they are virtually unsinkable under normal conditions. The Dominator has good clean, no-fuss lines. Fitted out with a 90hp Mercury two-stroke (the maximum rating for this hull), it is a well constructed boat for under $34,000. No excess clutter means Fi-Glass has achieved a sense of space on this small boat, without making the boat look too spartan. 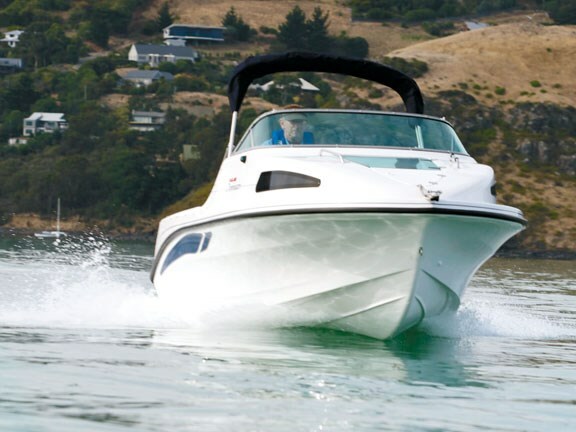 There is seating for a family of five with a single pedestal helm seat, a back-to-back passenger seat and two removable rear seats that double as boarding steps. All the upholstery on the boat looks good and is hardwearing as well as being UV stabilised. The forward cabin is fully lined with a durable fabric and contains two bunks adequate enough for a rest during the day while providing plenty of additional under-mattress storage. 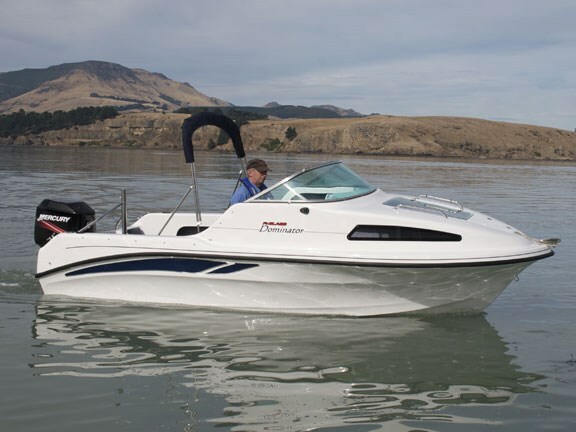 The fixtures on the Dominator are fairly basic in keeping with Fi-Glass Boats’ aim to put a quality boat in the water at a good price point. Access to the anchor locker is via the front hatch. The test boat did not have a bow rail, which is an optional extra. The console is basic but nicely finished in imitation walnut and features Mercury’s standard range of gauges. I liked the general helm set-up. The wheel console and throttle position are all easy to use either standing or sitting, and the visibility is good. The wraparound windscreen is tough polycarbonate. My main criticism of the boat in general, is a lack of hand holds. It was easy to visualise how the cockpit would be utilised by two keen fishers. The back-to-back passenger seat is at a good height to allow comfortable access to a tackle box at floor height. As there is no underfloor storage it would be wise to take an addition fish bin or ice box to hold the catch. Two rod holders are included as standard while additional stainless rod holders and a rod rack are optional extras. 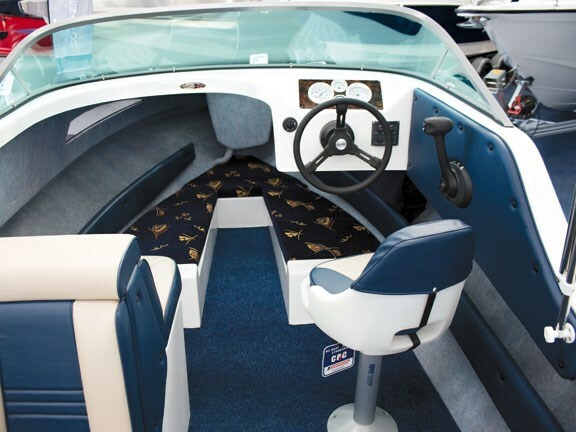 Removable screens keep the battery boxes and bilge pump out of sight while allowing for easy access. Fi-Glass- managing director Griff Simpson had spoken of a Fi-Glass development known as "Variable Longitudinal Deadrise". The basis of the concept is to produce a hull of relatively fine entry that quickly becomes a planning surface. In theory such a hull should produce a boat that planes at very low speeds with little need for engine trimming. Griff tells his customers to fix the trim of the engine in one position and never to alter it when at sea. In fact he goes one step further – actually marking the gauge at the point of trim were the boat runs best. What I observed was a smooth riding boat that accelerated quickly, planed at low speed, and had fantastically light and responsive steering. The Dominator is quick out of the hole and very responsive on the helm when trimmed correctly. The boat held remarkably well in the tights with very little cavitation. Downward facing chines directed the spray away nicely. All but one of the planning strakes has been removed in this hull, which should allow for a quieter, softer ride. At speed the boat feels safe and solid, and is surprisingly quick, cruising at 31.5mph and a top speed potential of over 40mph. Manoeuvring the little boat into the dock was straight forward and the vessel is light enough for any family member to handle if conducted in a gentle manner. 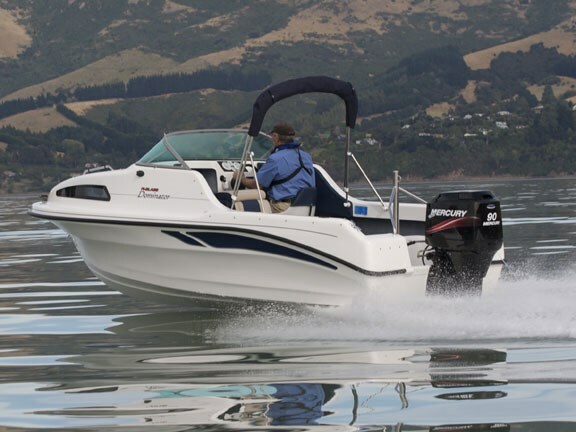 Overall the 510 Dominator is a well constructed boat ideal for general family use, and with a reasonable level of maintenance will hold its value well. 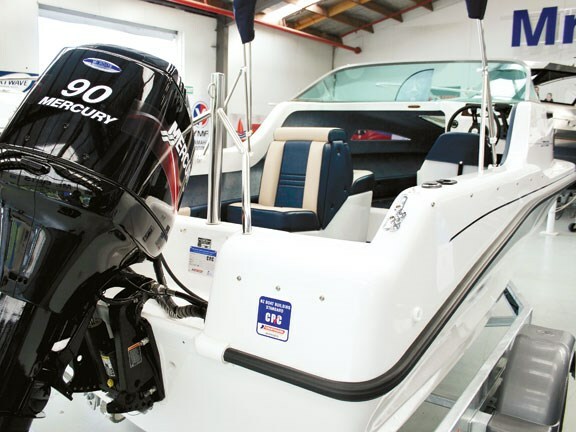 Any boat built to CPC standards that comes with a six-year warranty at this price should be seriously considered by anyone in the market for a boat of this class. See the Fi-Glass Dominator for sale.